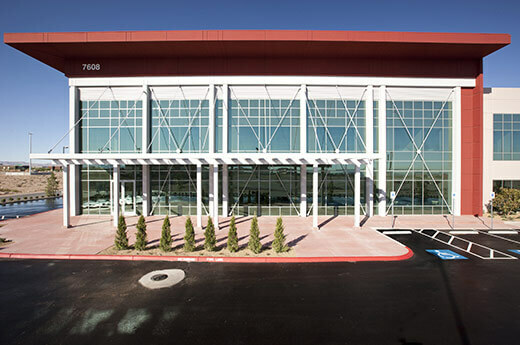 This Design/Build project is located on 6.5 acres and has a 120,500 SF of building foot print. The 25,000 SF 2-story corporate headquarters is designed to house up to 100 employees and includes a 2-story main lobby, several conference rooms, an employee gym, a 2,000 SF break area, executive offices, and flexible open office space for future growth. 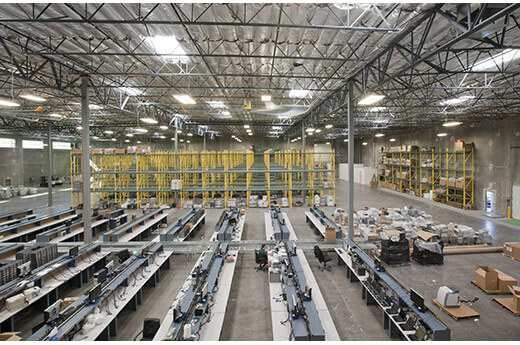 Anchored by 108,000 SF warehouse space the facility is primarily dedicated to office functions, while the warehouse functions will include light industrial, storage and recycling. The building incorporated LEED concepts into the design with increased insulation ratings, T light fixtures, large warehouse fans etc. 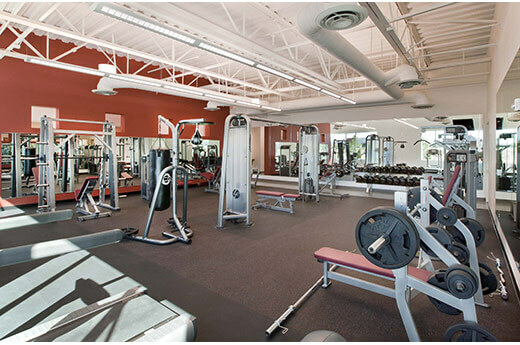 The shell and tenant improvements were completed on a fast track schedule in approximately 6 months. Quality control began in the preconstruction phase before any work began. We first reviewed the design documents to identify any potential quality control challenges. Met with the design team and subcontractors to make sure we had a “meeting of the minds” on how the finished product would look. Our emphasis is to get it right the first time and manage the process to decrease the likelihood of failure. The project was completed approximately thirty (30) days ahead of scheduled and under budget with credits being issued back to the owner. The contractor worked closely with the design team to ensure that the design intent followed through to construction. Communication was the key to the success of the final project. The interior design process was initiated with a user-centered approach to the development of a workplace strategy and space plan. The design concept for interior spaces reflected elements of the exterior architecture, celebrating the 2-story glass facade, which wraps the open atrium lobby, with a curved stair connecting levels 1 and 2. Representing US Micro’s values, the interior finishes were selected for their commitment to the environment. The subtle tones and minimal splashes of accent colors serve as a backdrop to the client’s unique art collection. 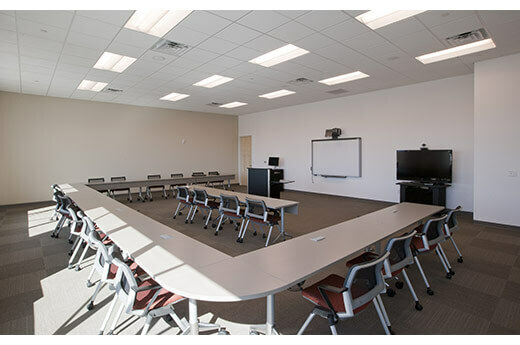 The light tones used on ceilings and walls, in correlation with glass at perimeter offices, enhances the natural daylighting of the interior spaces and provides a comfortable and innovative environment, promoting productivity and providing a stable foundation for US Micro’s future in Las Vegas. As the first “ground-up” project for our client, they experienced programming challenges. There were some internal processes that they had not completely refined and were not able to communicate their final programming needs to the design team and the contractor. As a result there were several revisions towards the completion of the project that required last-minute attention and quick turn-around by the designers and the Contractor in order to keep the budget and schedule on track. By being proactive with revision options, when necessary, the Contractor was able to communicate with the design team and ensure that the design intent was not overlooked. The building was designed to complement the Southwest desert region. The building design was driven by the environmentally conscious user. It exemplifies the company’s values incorporating modern, simple lines with a 2-story glass lobby and metal canopy. The varied height and massing of the overall building allowed for the entry to become the focal point. 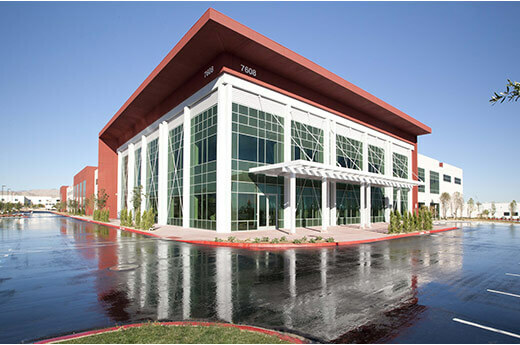 The building consists of approximately 25,000 square feet of interior office space on two levels and 108,000 square feet spread between two separate warehouse areas. LEED philosophy was consistently integrated throughout the design process, including behind the scenes function of efficient HVAC and electrical systems and more up front design elements. The design team purposely selected products with recycled content, such as carpet and porcelain tiles and designed comfortable work spaces by implementing a modern design that combined areas open to deck with dropped acoustical clouds over the workstations and private offices. As a function of design-build construction, all contractors were allowed to provide detailed recommendations to our design team. Each member provided suggestions for improvements on various finishes, and secondly, the cost feasibility for each of the suggested materials. This team collaboration proved innovative for the project.